Cape Town - Currently the funding of South African Airways (SAA) has not been undertaken in a deficit-neutral manner, resulting in a projected R3.9bn breach of the expenditure ceiling, National Treasury told Parliament’s standing committee on appropriations on Wednesday. Neither Finance Minister Malusi Gigaba nor Treasury’s director general could be present at the briefing due to being on road shows, the Treasury delegation told the committee. Treasury told the committee that it has been anticipated that the shortfalls in the capital structure of SAA could be dealt with in the Adjustments Appropriation budget. Treasury explained that SAA’s shortfall was dealt with in the recent mini budget, in which it was announced that the sale of Telkom shares will be used to offset this breach of the expenditure ceiling. According to Treasury, government has already held discussions with a potential buyer or buyers of the Telkom shares and once all the discussions and negotiations are complete, an announcement in this regard will be made. “The decision was not taken lightly, but has to be considered in order to maintain the credibility of the expenditure ceiling,” Treasury told the committee. 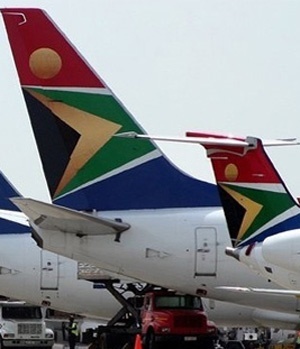 It said SAA’s domestic lenders are amenable to extending the airline’s R5bn loans to the end of March 2019 on condition of, among others, an R10bn equity injection for the airline announced in the mini budget in October; the appointment of a new chair or the board (which has been done); as well as the appointment of a permanent CEO (which has been done). The R10bn recapitalisation proposed for SAA in the mini budget for 2017/18 includes R2.2bn transferred to the airline at the end of June 2017 regarding loan agreements and R3bn transferred at the end of September for the same reason. The remaining R4.8bn will be transferred as R1bn each at the end of December 2017, end of January 2018 and end of February 2018 and R1.792bn at the end of March of 2018. The lenders, however, agreed subject to certain conditions. These include that before the R4.8bn is transferred in this way, SAA must provide an implementation plan for its 5-year turnaround, approved by the board and submitted to Treasury by the end of December 2017. The board must provide an action plan to address findings of independent forensic investigations by the end of December 2017 and the airline must identify non-core assets for potential disposal by the end of December 2017. Furthermore, a chief commercial officer and chief strategy officer must be appointed by the end of January 2018. Lastly, SAA must develop an integrated network and fleet plan to identify routes where SAA, SA Express and Mango all fly the same route, for instance. Treasury told the committee that Gigaba has met with the SAA board and emphasised the importance of the airline meeting the conditions set out before funds will be transferred. Members of the committee raised various questions with Treasury on its presentation. One member wanted to know why these conditions had not been put in place before. “You knew these loans were coming. You knew the payback dates. Why did you assume the lenders would extend the loan?” he asked. Yvonne Phosa (ANC), chair of the committee, told the Treasury delegation that it must take the recommendation by the Financial and Fiscal Commission (FFC) seriously regarding more oversight of SAA’s spending. “We must be able to intervene timeously and not wait until things are as bad as now,” she said. Treasury told the committee that it is extremely frustrating when an SOE keeps on coming back again and again for more money without solving the problems causing the need. This is because the money used to help out an SOE like SAA, would then not be availble to fund for instance schooling. Phosa pointed out that, apart from the R10bn allocated to SAA, it is estimated that the airline still needs about R7bn to be solvent. “How can we do that? How do we get out of that situation?” she asked the Treasury delegation. A Treasury official replied that, due to the extension of SAA’s loans, coupled with the government guarantees, the airline can still be regarded as a going concern and not bankrupt. Treasury added that a lot of issues at SOEs have become too “political” (with a small 'p' it emphasised) – regarding what the powers are of the minister, board and CEOs, for example. And there is a lot of blame shifting. There seems to be a design problem regarding who has to take responsibility. At the same time, in its view, in many cases responsibility was not taken on the most appropriate action. Treasury acknowledge that it could maybe have acted sooner and that there was political resistance (“with a small p”) in many instances to decisions being made. It said there it is also looking at how could maximise – or even merge – some of the state-owned airlines.